It's been really windy lately and our mulch keeps getting blown away. Googling for suggestions I noticed this MulchGard but it doesn't appear to be available in Oz. @MartyH, we lose mulch down the street on windy days, so what I've done is lay a thick bed of home mulched/shredded prunings from our garden as a base, then cover it lightly with bought playground/softfall wood chips for cosmetics. 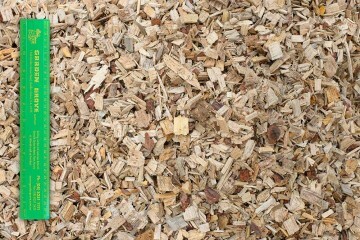 Other areas of our garden aren't wind affected, so we've generously applied the softfall wood chips there. When the streetfront area of bought chips thin out, I scavage some from the plentiful areas. Some less accessible areas of our landscape don't have plantings, so we've laid Gumtree sourced river pebbles there, & it's been highly effective in controlling weeds. That could be an option for you too, you could spread them over your existing wind prone mulch. A completely different approach, would you be able to drape Anti-Bird netting over the mulch? Not sure if it is at a price for a home garden. Anyway found some more choices. Geospray is what most mines use, it does look a bit green though. Watering ahead of a windy day can help. As can growing ground cover. There's been another discussion about ground cover options in recent days.